Just like people with thick hair, those with thin hair might find it challenging to get long-lasting curls in their hair. Usually, the reason boils down to not having the right tools for the job. People with fine hair need styling tools that are gentle enough to avoid breaking or causing heat damage to strands, but powerful enough to keep curls in all day. 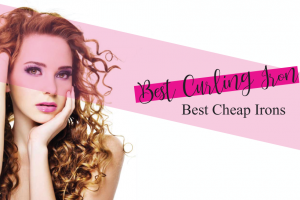 This review and guide should help you find the best curling wand for fine hair. We selected five of the top-performing curling wands that can gently style thin hair and leave it looking as healthy as it did before. The Remington CI96W1B T|Studio Silk Ceramic Slim Styling Wand is a helpful fine-hair tool with silk ceramic technology infused with silk proteins to help nourish hair as it curls. For adorable, tight curls, the Herstyler Baby Curls Mini Curling Iron can be an excellent option for fine hair. The narrow ceramic barrel can help cure your hair’s cuticles to prevent breakage. 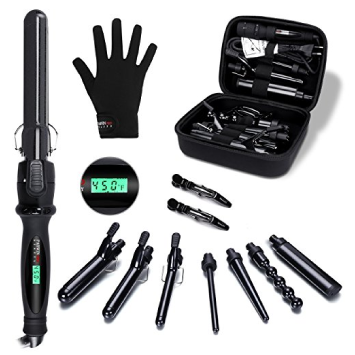 The 7-in-1 PARWIN BEAUTY Curling Wand Set is a bit higher in price than others, but you’ll also benefit from having seven tools to use for various styles. You can set the temperature as low as 170-degrees Fahrenheit to keep ultra-thin locks protected. 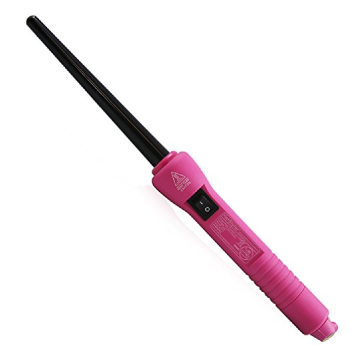 The lowest heat setting of 270-degrees Fahrenheit of the SUPRENT Hair Curling Wand with Ceramic Technology can be gentle enough for even the most delicate hair, and you can quickly adjust the temperature with the click of a button. The Remington Pro Curling Wand with Pearl Ceramic Technology has several heat settings to meet the needs of various hair types, and the pearl ceramic barrel may help smooth and protect hair as you work. 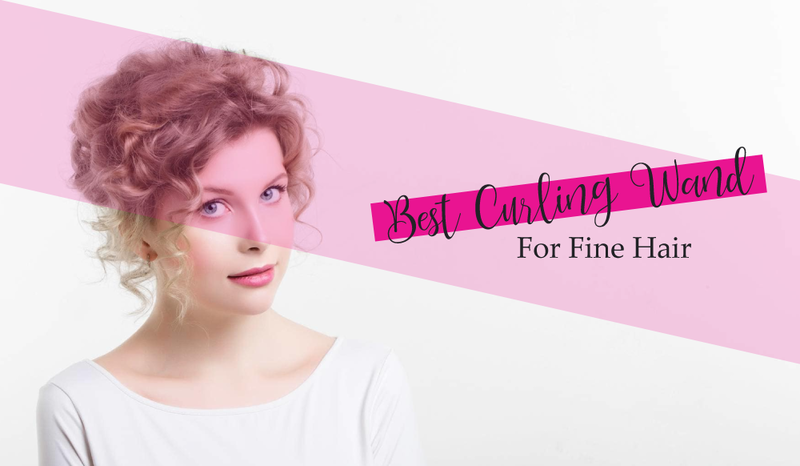 The following five curling wands are our top suggestions for tools that can plump up your fine hair and give you the naturally curly look you want while leaving your hair as healthy as possible. The Remington CI96W1B has a narrow ½-inch to 1-inch tapered barrel that can be helpful in creating tight curls in fine hair, especially if you have layered bangs or hair. The barrel’s made from Remington’s silk ceramic technology, which creates an ultra-smooth finish and helps hair glide easily off the tool. The tool heats fast and can go up to 410-degrees, but there are adjustable temperatures so that you can find the best one for your hair. Change the temperature with the click of a button and it will read on the large digital display. The most common complaint among reviewers of this curling wand is that the tip can snag hair as you release curls. We suggest letting your curls fall naturally from the barrel rather than trying to slide hair off the barrel to prevent snagging. If you’re looking for the tiniest, tightest curls, the Herstyler Baby Curls Mini Curling Iron may be your best option. This iron can be especially helpful for women or men with very short, fine hair, as the tapered ½-inch to ¾-inch barrel is small enough to curl the shortest strands and layers. You won’t get any bells and whistles with this curler; its only button is an on-off switch. If you want something simple for tight curls and formal styles, though, this curler may be all you need and at a very budget-friendly price. This curler has no temperature adjustment because high heat is necessary for creating such tight curls, so you’ll need to be careful about your timing when using it. 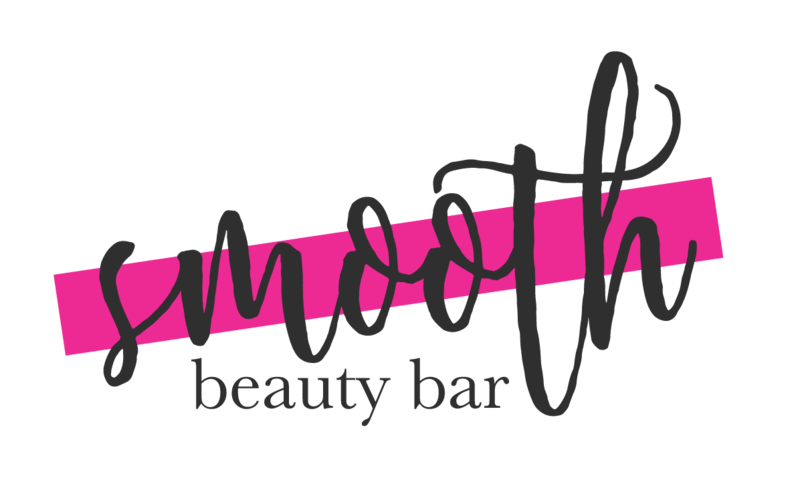 However, several customers say that the product keeps their hair smooth and healthy-looking and that they’ve noticed no heat damage. PARWIN BEAUTY’s curling iron and wand set will take a bit more from your wallet than other single tools, but you’ll also get seven tools in one. This set comes with three clipped irons and four clipless tools to give you a lot of options when it comes to styling your hair. For fine hair, you’ll likely use the clipless barrels the most. You’ll have an oval barrel, corkscrew barrel, tapered barrel, and a narrow, straight barrel to create different looks. The tool heats up fast, which can be a considerable benefit on busy mornings, and you can change the temperature settings with the push of a button. Temperatures range from 170-degrees to 450-degrees in 10-degree increments to easily match one with your hair texture. Customers rave about the simplicity of switching the barrels, so you can even create different curls in one look quickly. This SUPRENT curling wand may be a good option for people with fine hair who crave the look of long, beachy waves. The tapered barrel measures 1 ½-inches at its widest point and ¾-inch at its narrowest, so you can achieve loose curls with tight ends and can ensure that layers get a curl. The ceramic technology of this barrel is advanced, offering incredibly even heat throughout the barrel to prevent hot spots and scorching of your fine hair. The technology also helps your hair slide off seamlessly to avoid snags and breakage. This curling wand may be best for medium to long hair lengths, as the wide barrel may be too bulky at its widest point to get a tight curl in short hair. One customer with fine hair who has bought and used the SUPRENT curling wand that said this product has been one of the few tools she’s used that has actually been able to leave a long-lasting curl in her hair. 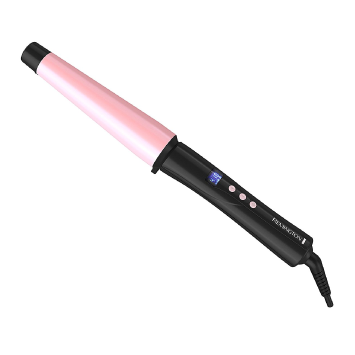 Others claim that this curling wand is one of the simplest to use and like its durability. 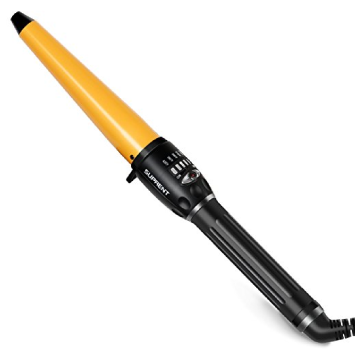 The Remington Pro Curling Wand with Pearl Ceramic Technology is one of the brand’s most popular curling wands because of its ability to create the desirable beachy look that so many women adore. This tool has a 1 1/2 -inch to 1-inch tapered barrel to create large, bouncy curls that you can gently separate into waves on medium to long hair. The Pearl Ceramic Technology that Remington introduced into this model is what makes it stand out for fine-haired users. Not only does this material create a long-lasting barrel, but it also helps to smooth your hair and make it effortlessly glide off the barrel to avoid snags. Several customers love how fast the barrel heats up, so they don’t have to wait several minutes to get started styling. 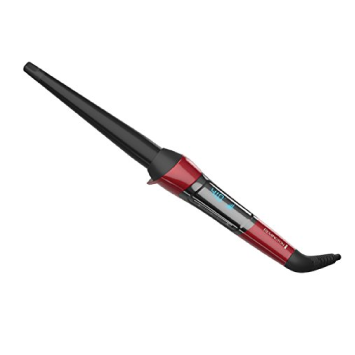 With the adjustable heat settings, many users find it simple to get a temperature that meets the needs of their hair. There’s no one-size-fits-all approach when it comes to hair, so no one curling iron will work for everyone. However, when you have thin hair, there are a few essential features in a curling wand that may help you get the look you want without damaging strands. Choosing a smooth barrel made from materials like ceramic or tourmaline, or a combination of the two, can reduce the risk of snagging and damage caused by the barrel. Additionally, these materials work together to release negative ions that infuse within your hair to prevent damage and keep your locks looking smooth and healthy. Curling irons can have a clipped or clipless design. The clipless version is usually referred to as a curling wand. The benefit of using a wand over a curling iron for fine hair is that you’ll have a reduced risk of getting your hair snagged on the clip and pulling hair from the root or breaking it mid-strand. Clipless wands require a bit more effort to use because you’ll need to wrap and hold your hair around the barrel yourself, but they can also give you a natural, crimp-less look. Low temperatures are necessary for fine hair, which can be more susceptible to heat damage than normal to thick hair. Depending on how fine your hair is, you should look for a styling tool with variable heat settings that can reach as low as 140-degrees. Most hair types can tolerate a range of 250 to 350-degrees. Knowing how to use a curling wand properly can make or break your success when you have fine hair. Virtually everyone should opt for using heat-protectant products before styling, especially if they use heat styling tools frequently. These typically come in sprays or conditioner-like creams that you can apply to your hair before using your styling tools. For fine hair, especially, you should consider using a heat protectant spray before each use of your curling wand to nourish your hair and protect it from split ends and breakage. Always start on the lowest heat setting if your curling iron has adjustable heat. Once you become familiar with the device, you can gradually increase the temperature to find a setting that works well with your hair. You should also play around with times to find the perfect amount of time your hair needs heat to maintain a curl. For most women with fine hair, no more than 10 to 20 seconds is usually an ideal time. Since you may want to create a lot of different styles with your fine hair to give it a more voluminous effect, we recommend the PARWIN BEAUTY Curling Wand Set as our pick for the best curling iron for thin hair. This set is virtually unbeatable with its seven tool options. You’re almost guaranteed to find one that will work for your hair length, style, and texture. We love that the set includes four clipless barrels to help women with delicate hair get a beautifully curled look without worrying about snagging hair on a clip. The ceramic barrels also help to create a smooth, finished look and reduce the risk of breakage and split ends. 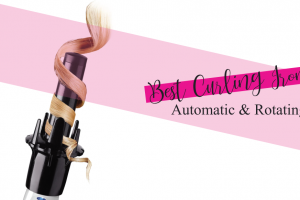 We hope this guide and review of our picks for the best curling wand for fine hair helped you settle on a tool to give you the style you’ve always wanted while also keeping your locks looking their healthiest.